Who are These Members – Musical Ride – 1957? I received so many great responses to an earlier posting of “Who is this Member?” It turned out to be a photo of Cpl. Eddie Hill of the Equitation Staff at “N” Division in the early 1950s I thought I would try one more time with some publicity photos taken of Musical Ride members around 1956/57. It may trigger some memories of former Ride members. 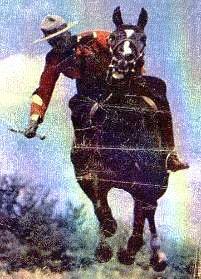 Below is an advertisement prepared by the National Film Board for appearances by the Musical Ride. This particular one was for the Ride’s appearance in Chicago in 1957. Note it could not be released until near the date of the appearance of the Musical Ride. It would appear that it was a standard “media release” wherever the Ride appeared. The barrack room photos were probably taken at “N” Division, as the Musical Ride was not a permanent unit in 1957 and recruits, based out of Ottawa, “Depot” and Vancouver, were often used to perform the Musical Ride. 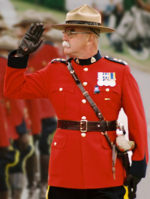 Inspector J.G.C. Downey (Reg # 12788/O.444) and Riding Master, Staff Sergeant R.R. Van Patten, Reg # 11862, pictured, were both posted in “N” Division in 1957 and are pictured in the “media release”. Below, Insp. Downey, aboard “Kao”, meets a famous lady, Jacqueline Kennedy, in Ottawa in 1961. Mrs. John Diefenbaker and Commissioner Clifford Walter “Slim” Harvison stand directly behind Mrs. Kennedy. 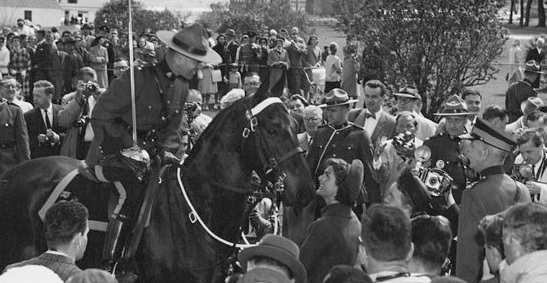 This is the same year the Musical Ride became a permanent entity of the RCMP. The Ride became an annual performance. Up to 1961 it had been impossible to plan performances far in advance, as there had always been doubts about whether or not the Ride would continue. Over the years when the government was always looking for cut backs in budgets, the Force would always offer up dis-continuing the Musical Ride. The Ride continues to this day…still a very popular attraction for Canadians and people from around the world. The pictures below are clearer versions of the ones used in the media release. They should bring back some memories for those who trained in the 1950s. Check out the blue kit bag and the old heavy rubber rain coat hanging on the wall. The trunk, used to pack up kit not only for the Musical Ride members, but used by members on transfers from post to post over the years. Nice haircut…high and tight! Note the strategically placed photograph of the girl friend back home in the photos above and below. I wonder if they were store bought frames with the photo included for the photo op? Or, were they the actual girlfriends, as marriage was not allowed early in a member’s service in the 1950s? Did those relationships last? So many questions from a simple photograph! Nothing like a peck on the cheek to cement a relationship after a good grooming and cleaning a horse’s stall! As Willie Nelson put it so nicely, and probably describes the life of Musical Ride Members… “On the road again, I just can’t wait to get on the road again, here we go, on the road again…..Like a band of Gypsies we go down the highway. We’re the best of friends”. How many broken hearts were left behind with Scarlet Fever?